As we wave goodbye to the first month of 2019 (I know, right? what even is time and why does it move so fast) I'm back with more thoughts on some recent short fiction, and I'm happy to announce that this is going to be a regular feature! At the end of each month, I will be taking some time to run through the rotating selection of mostly-recent magazines and anthologies that have recently crossed my eyeballs (and hopefully also my brain), and sharing some of the highlights and general impressions with you. As I mentioned in my "pilot" roundup last month, short fiction is a new area for me and I'm still trying to establish how I can best engage with some of the amazing writers and publications in this space. I hope, therefore, that this monthly column will be useful not just for those interested in finding good stories, but especially for fellow readers who find themselves stuck in endless "I should read more short fiction but what and how" thoughts. I'm here for you, friends; let's do this together. A Thousand Beginnings and Endings ed. Ellen Oh and Elsie Chapman (2018). 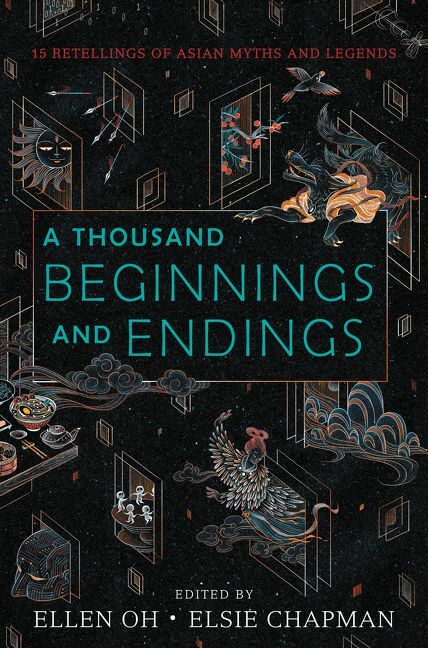 This is an anthology of Asian fairytale retellings by Asian authors, bringing a range of folklore, legends and ghost stories from across the continent into new perspective. 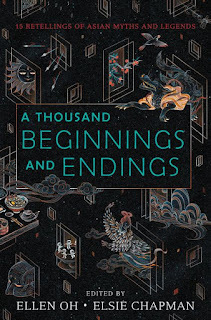 Most of the authors in this collection are new to me and while I was expecting variety in the myths and cultures represented ("Asia" encompasses over half the world's current population, after all), what I didn't anticipate was the even wider range of genre and angles of adaptation taken here. There's several straightforward retellings, which take place in recognisably "fairytale" settings even as they change the voice and agency of the story's characters ("The Crimson Cloak" by Cindy Pon leaps out here). However, there's also several stories that play with science fiction and speculative futures, including "Steel Skin" by Lori M. Lee with its take on artificial intelligence; urban fantasies like "Code of Honor" by Melissa de la Cruz with its melding of Aswang and western teen vampire stories; a take on time travel from a deeply mundane perspective in "Spear Carrier" by Rahul Kanakia; and even a spot of lovely female-friendship centred contemporary YA in "Girls Who Twirl and Other Dangers" by Preeti Chhibber. There's also a strong thread of diaspora experience running through many of the stories, including Chhibber's tale mentioned above, as well as an interesting ghost story from Alyssa Wong, "Olivia's Table", which sees a woman taking on the mantle of her mother in catering to the needs of spirits congregating on an Arizona hotel. This category also includes my favourite story overall: "The Land of the Morning Calm" by E.C. Myers, which translates multiple narratives from Korean folklore, particularly the Chasa Bonpuli, into a tale of identity, loss and online gaming, as a young woman processes the death of her mother at a video game conference and the imminent shutdown of the server where her entire family used to immerse themselves in the world of the titular Land of the Morning Calm game. The speculative elements transition nicely between the real world and the world of the game, and there's a lot of interesting and complex emotional material here. 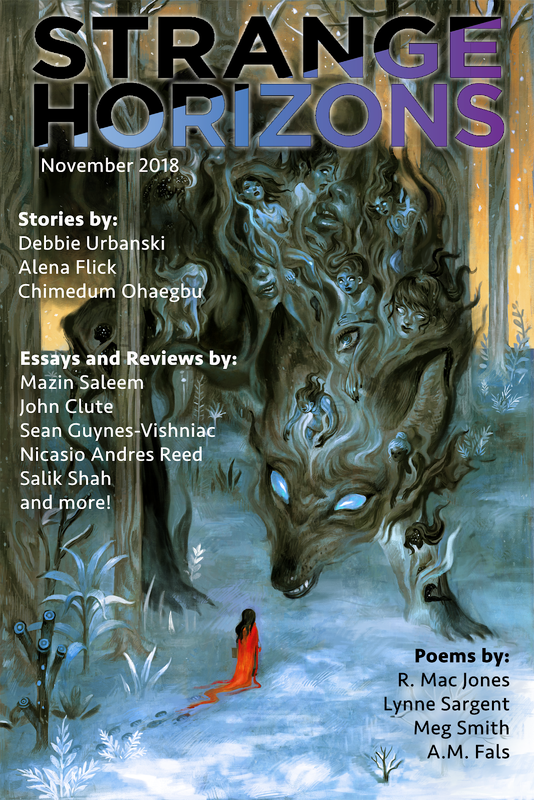 There are three original stories in the October edition, encompassing very different voices with strong sense of place and a running theme of death and loss. Fans of Aliette de Bodard's 2018 short novel In The Vanishers' Palace will find a rather different-feeling woman-dragon relationship in "The Palace of the Silver Dragon" by Y.M. Pang (1 Oct), a story which really leans into its protagonist's feelings of grief and frustrated lack of agency both in her present and in the memories of her past. The sea-dwelling slave-descended folk of "De MotherJumpers" by Celeste Rita Baker (15 Oct) - playing on a longstanding Afrofuturist concept similar to the society in Clipping's The Deep - provide background for a similarly dark and grief-heavy tale of loss and how it stretches ties within a community to breaking point. Isabel Yap's "Asphalt, Mother, River, Child" (8 Oct) deals, to devastating effect, with the deaths of innocents in the Philippines as a result of the country's destructive, discriminatory "war on drugs", bringing a fantastic sense of place and character (including use of Filipino vocabulary, for which the story provides a glossary at the end). 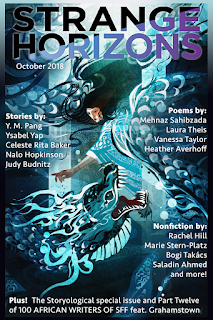 After all that, the two reprints in the 29 October issue are a welcome shift into lighter storytelling, including the possibly-too-smutty-for-me-but-still-excellent "Fisherman" by Nalo Hopkinson. 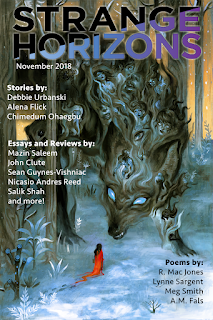 November also brings some strong material to the table, including Chimedum Ohaegbu's weird fairytale, "Toothsome Things" (19 Nov), and the sweet "Missed Connections" by Alena Flick (12 Nov). However, it was "Some Personal Arguments in Support of the BetterYou (Based on Early Interactions)" by Debbie Urbanski (5 Nov) that most successfully broke my heart. It's the story of an asexual woman trapped within an unsupportive family, who is encouraged to create a better version of herself through technology in order to provide them with the love and attention they "deserve". The protagonist's attempts to communicate her wants and needs and to push back against the one-way expectations levelled at her are contrasted with the total resignation with which she starts and ends the story, a resignation which is framed as generational but more fundamentally asks "why shouldn't we just be someone easier for our loved ones to manage?" It's a question which, among progressive communities that encourage self-identification and acceptance, we're not supposed to ask in seriousness, but in presenting a speculative "solution" Urbanski drags that unspeakable doubt into the open, and forces us to confront it in a difficult but compelling way. 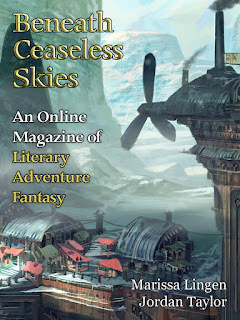 Clarkesworld is a publication that's been on my radar with the occasional - usually excellent - story for a long time, and this year I've cemented my commitment to reading their work by taking out an ebook subscription. The first issue I got through this was actually the last of 2018, but it's a good place to start as it squeezes an extra new story in, with just a single reprint from the six overall pieces. It's a rollercoaster of interesting science fictional concepts, from the slightly skewed augmented reality tech of D.A. Xiaolin Spires' "Marshmallows", to the supposedly empathy-generating implants given to the young protagonist of "The Names and Motions" by Sheldon J. Pacotti, to the commodified air and its international impacts, told through a breakneck international conspiracy, of "Bringing Down the Sky" by Alan Bao. What these stories share is a sharp, effective focus on the speculative elements and the parts of the story (be it character, place or plot) that bring out the most interesting (and, in this issue, generally negative) implications. My personal favourite of the issue was "When We Find Our Voices" by Eleanna Castroianni, which deals with the relationship between "Sons of Man" - a group of all-male humans - and an "Adapted" race of bird-like people with three genders and complex, human-compatible reproductive abilities. At the point of the story, humans have managed to subjugate and exploit the Adapted. It's told through the relationship between two Adapted - a third-gendered "Etu" whose role in reproduction is to bring together genetic material from the other two partners (I had some strong Octavia Butler feels here), and their male partner, who is forced into a marriage (technically they both are) with a human man in order to give him a child. Both characters' increasing dissatisfaction and questioning of their society and the things they are forced to do plays out in different ways, and I could easily have read twice as much about these characters and the fascinating, if grim, world they inhabit. As many readers will know, Clarkesworld has an ongoing focus on bringing Chinese science fiction in translation to the English-language market, and this issue brings “Master Zhao: The Tale of an Ordinary Time Traveler” by Zhang Ran, translated by Andy Dudak. I wasn't quite sure what to make of this one initially - it doesn't help that it's not a super smooth translation, although I'm confident it gets across the message of the original - but by the end I was very invested in the story of Zhao, who finds himself constantly travelling back to points in his own timeline - generally after disasters befalling either himself or his chronically ill wife - and can make different decisions to try to bring about a better outcome. Zhao's story is being told within the narrative to Zhang, an unemployed 30 year old living rent free in Beijing, and that framing is used to explore the practicalities of Zhao's ability (there are many diagrams involved). But I think the story's most compelling aspects lie in how it exposes the sense of inequality and hopelessness in which Zhao, a working class man in a country with no social safety net, is forced to repeatedly confront the limitations of his own position and his inability to find better support for his wife. I'm also new to Beneath Ceaseless Skies' subscription, but I've consistently enjoyed the fiction I have read from them and this pair of issues (they release two stories biweekly, I think?) was a great start to my more regular commitment. The first kicks off with "The Blighted Godling of Company Town H", by Beth Cato, in which an abandoned guardian struggles to protect her people from decay and destruction, in a world where the company that originally formed them is clearly long gone. "The Beast Weeps With One Eye" by Morgan Al-Moor is a story of ravens and havens. To be more specific, it's about people finding havens to save them from ravens. To be even more specific and perhaps a bit less flippant, it's a neatly situated fantasy story about the last of a tribe, the Bjebu, who have fled destruction only to find they need to make an offering of three sorrows to the Father of all Ravens. It's worth spending the time on, and as a debut author Morgan Al-Moor is one to add to your Campbell watchlists. 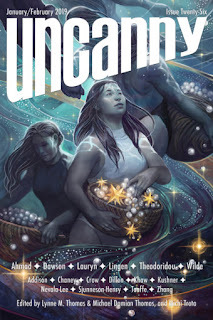 I liked "La Orpheline" by Jordan Taylor, a historical urban fantasy with an operatic setting, but the story that really struck me in Issue 269 was "The Deepest Notes of the Harp and Drum" by Marissa Lingen. What I love about this tale is how matter-of-factly amoral it is: the narrator tells us within the first page that she has killed her sister over what can only be described as dubious provocation, and the story is mostly about her and her new partner attempting to escape any repercussions from those past crimes. The women recount their struggles in a way which is so reflective of the way we expect wronged parties' troubles to be addressed in fairy tales that it's very hard not to root for them, and the "moral" that the creatures of the wider world have better things to do than pay attention to humans, even when they are murdering each other for fun and (maybe) profit, is neat on one level but introduces some real "wait... what?" moments on further consideration. It's fascinating to have the trappings of this kind of story used to tell "here's a couple of complicated but frankly Not Great people making peace with their consciences and getting away with murder", and assuming it was an intentional subversion, I really like the food for thought it brings. 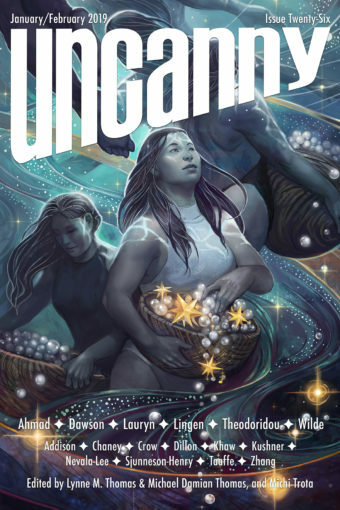 The last couple of Uncanny Magazine issues have knocked it out of the park to the extent where it almost feels unfair to compare this issue to what's gone before. That said, I did struggle somewhat to connect with some of the fiction here, in which every story appears to be an involved family drama, or a quiet post-apocalyptic moment, or an involved family drama after the apocalypse. 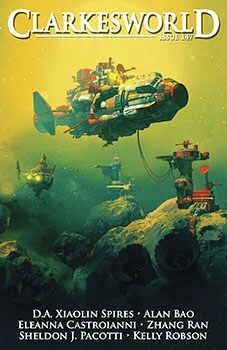 That might be my failure as a reader to give every story enough space to sink in as a distinct entity, but the only imagery that really stood out was Fran Wilde's story, "A Catalog of Storms", which brings her trademark skill at weird worldbuilding and applies it to a tale of sentient storms. It's safe to say I am a guaranteed customer for Wilde's future short story collection as and when it comes out, but even the story here didn't make a huge impression on me beyond the "hook". Beyond Wilde, I did like some of the other things in here too: "The Willows" by Delilah S. Dawson is a really creepy, claustrophobic tale of haunting in an isolated farmhouse, and Dustdaughter by Inda Lauryn recounts the story of a young girl coming into her power against her mother's wishes and is also pretty great. There's also a reprint of "The Duke of Riverside", an Ellen Kushner story which recounts a pivotal moment in the Tremontaine-Riverside saga. Overall, though, I came out of this feeling like the juxtaposition of this particular group of similar, quiet tales left me struggling to do justice to each story in turn - perhaps they'll work better for me on a revisit someday.